When it was announced that SciFi Channel was going to be producing a new Battlestar Galactica show, response was underwhelming - in terms of multi-generational appeal, BSG is no Star Trek. The show ran its course and was relegated to "obscure trivia" status long ago. Sure, the fans of the original show were up in arms about the rumored changes, but to anyone born after, say, 1975, the news meant nothing. It was just the show that was replacing Farscape in the budget. We were all in for a surprise though, because the new series turned out to be the best thing on television, and was popular enough to earn its very own toys - including 2" Minimates from Art Asylum and Diamond Select. Before the first two-packs shipped, DST offered an exclusive five-pack though the Suncoast/F.Y.E. family of stores. Diamond's promotional copy said "If you missed last year's Modern Cylon Minimates, this is your chance to add all five to your collection." Why yes, it is easy to "miss" something that never actually got released! Anyway, the Cylons have finally arrived, and they're awesome. Artificial species created by humans to be robot servants, the Cylons developed sentience and rebelled against their creators. Following a decades-long war and a 40-year truce, the Cylons returned in a massive surprise attack against the 12 Colonies, with the intent of eradicating the human race. The Cylons now control all the planets of the Colonies and appear to be in the process of rebuilding them for their own use. Their warships also continue to hunt the escaping Colonial fleet, where a handful of human form Cylons operate undercover. The Cylons exist in many different models, including Raiders, the metallic soldier Centurions and 12 individual human models. For $20, you get five unique Cylons, distinguished by paint apps and accessories. Since they all share the same basic body, though, we'll take a look at their construction, first. You're familiar, by now, with the generic Minimate body: cubic torso, tube arms, cylinder head, all that. All the 'mates share the same body with different paint decos, and they all move at the same 14 points: neck, waist, shoulders, elbows, wrists, hips, knees and ankles. 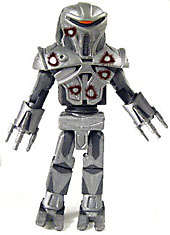 The Cylon minimates have a grey body with a black head and paint on the legs. When designer Eric Chu was creating the new-look Cylons, he had a fine line to walk: tie them, stylistically, to the goofy old costumes, but actually make them look scary. The final product looks like a mechanical grim reaper, and is so extended and distorted that it's obvious there is no way this is a guy in a suit. Even more than the Terminator, they look like killing machines. Since the Cylons' structure is so different from a human's, the figures needed something more than a plain block leg - there are black paint apps suggesting the structure of a Cylon leg. It's not perfect, but it's better than nothing. To re-create that soul-less, inhuman look in block form, Art Asylum turned to well-known customizer Matt "Iron-Cow" Cauley. He designed a bunch of add-on pieces to give the Toasters their modern look: new feet, new hands, a "belt" piece to extend and narrow the waist, giant shoulderpads and a Cylon facemask. All the extra gear gives these 2" Minimates and extra ½" of height. Once assembled, the likeness is really impressive. Big thumbs up, Matt! There were apparently five Cylons in the phantom "release" last year, and they're all here: Cylon Centurion, Cylon Cannon Centurion, Battle Damaged Cylon, "Valley of Darkness" Cylon and the super-limited "Downloaded" Cylon. with a dull grey paint app and long fingers on his hands. 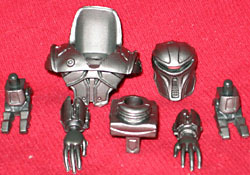 That's very similar to the Cylon Cannon Centurion, which has the same body, but has its hands retracted to reveal guns. The Battle Damaged Cylon looks very impressive on the packaging, with lots of detailed "damage" painted on; in reality, though, all you get are two smudges of dark paint. Though it is ostensibly an episode-specific figure, the "Valley of Darkness" Cylon could be from any encounter with humans: its claws are bloody and there's a lovely smeared handprint on its chest. Finally, the "Downloaded" Cylon is a bit of a misnomer, since Centurions don't download and resurrect like the skinjobs do, but his snazzy silver paint job really makes him stand out. Everybody loves a good army builder - especially when you can actually get them in bulk. 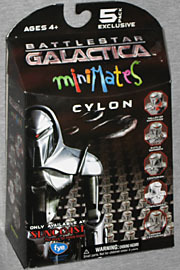 Ignoring the Cylons' imaginary release last year, this is a great debut for the BSG Minimates. They look scary, and they're inhuman enough to play their role perfectly. The work that went into making block figures of completely un-blocky characters is to be commended. The two-packs are only offering one Toaster per series, so if you want a truly threatening army of Centurions, hunt down this five-pack before it disappears. So say we all. What's your favorite updated part of the BSG mythos? Tell us on our message board, the Loafing Lounge.